When everyone claims to make the best home security camera, how do you choose? There are HD cameras. Wide-angle cameras. 1080p cameras with night vision. Indoor, outdoor and doorbell cameras. Do you look for the latest features, the biggest discounts, or the best security camera reviews? With so much to consider, it's easy to miss a very important detail. It's not all about the camera. Look at the platform first. While a smart security camera's components, design and engineering make a big difference, the software platform is where the "smart" part happens. Your camera's app and its features, your video alerts and your customization options are all determined by this layer of digital technology. It's why we think the best home security cameras are powered by Alarm.com. 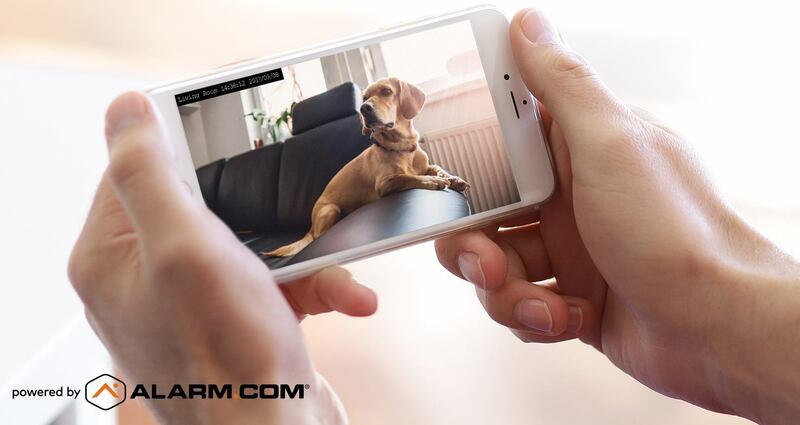 Alarm.com-powered cameras come fully integrated into our platform and app through your smart home security system. As well as best-in-class hardware, they give you advanced video features, extra home security benefits, and an easy, professionally-supported experience. 1: See what's going on from anywhere, anytime. Whether you're investigating a strange noise outside, or just saying hello to your kids from the office, the Alarm.com app makes things easy. You can view a live stream from any camera with your smartphone, tablet, desktop, Apple Watch or even your TV. You can be at work and still talk to a visitor at your door. If you get an alert that your alarm is going off, you can open a camera feed, zoom in to see what's going on, then verify or cancel the alarm signal—all from the same screen. Viewing recorded footage is just as easy. Alarm.com stores your video clips securely on our cloud servers for you to watch, download and share whenever you need it. 2: Stay in the know with intelligent clips and alerts. All smart security cameras have motion detectors that trigger video recordings and smartphone alerts. Got a busy home? You can look forward to a lot of alerts—or you can take the Alarm.com route instead. 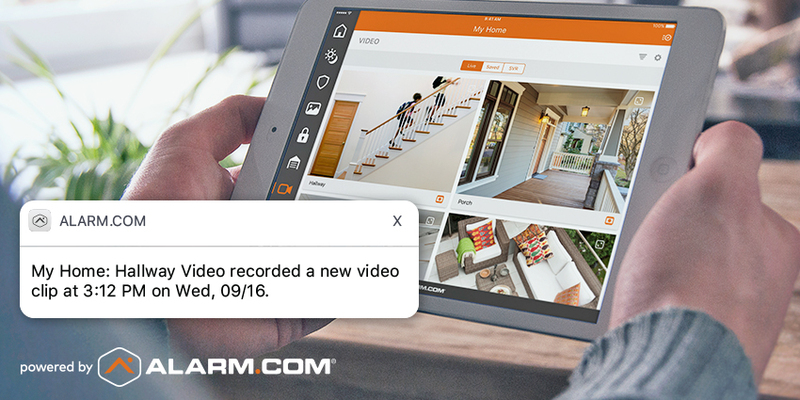 With security system intelligence, our cameras understand what's going on. It means you can customize and filter your alerts for a better experience. For example, you can have Alarm.com turn off all alerts from indoor cameras when your security system is disarmed. You can also set up triggered video alerts for specific events. 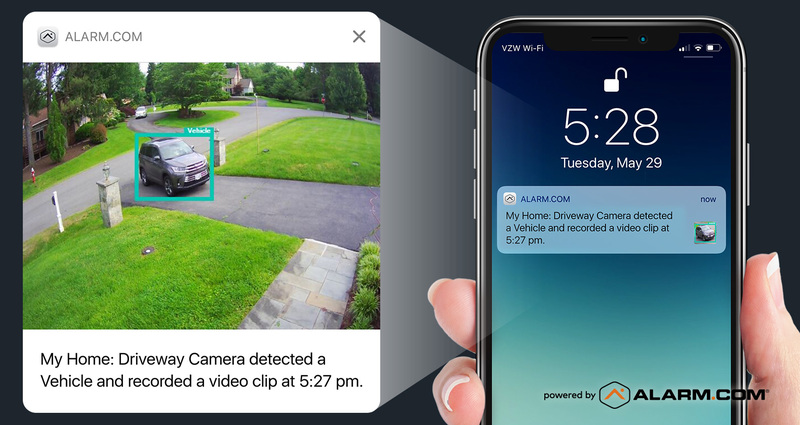 If you want to see your kids arrive home after school, for example, you can have Alarm.com send you a video clip from your hallway camera when they unlock the front door every day. 3: Get better crime prevention features. 4: Invest in security cameras that keep getting smarter. Security camera technology gets better every year. Some manufacturers expect you to replace your cameras frequently to keep up. We don't: instead, we release new features and services digitally, using our platform to keep your cameras up-to-date for longer. Take our new video analytics service. It uses artificial intelligence to make sense of what your cameras see, in real time. It can tell whether an object in your driveway is a person, an animal or a vehicle. It can ignore a person who visits your front door and then leaves (the mailman), but alert you when a visitor lingers too long on your porch. 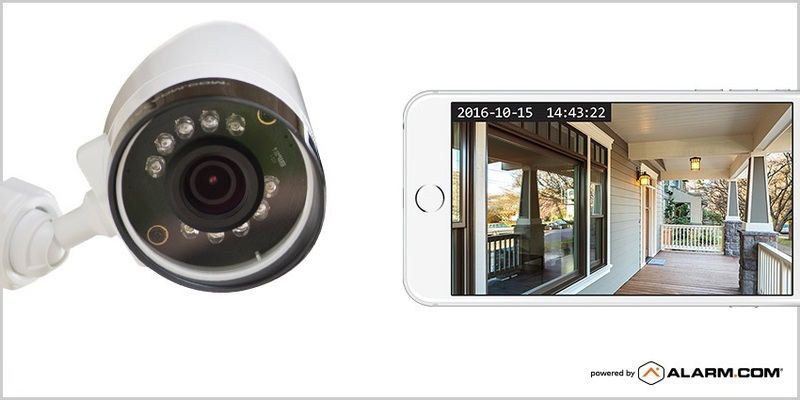 Industry experts praised it not just for its smarter video alerts, but also for working with our most popular indoor and outdoor cameras. 5: Professional installation and support makes it easy. Have you ever installed security cameras? Our expert service providers make this part easy. They can help you choose the best cameras for each area of your home, then install and connect your cameras quickly and cleanly for you. Should anything go wrong with a camera after installation, your service provider will be on hand with the tools and know-how to fix the issue. Want Alarm.com-powered security cameras for your home? The best home security cameras can be part of the package when you choose smart home security powered by Alarm.com. Delivered by professional service providers, it's the easy way to enjoy smart home technology and keep your family protected. To find your ideal Alarm.com service provider, enter your ZIP code in the box below.